Rumor has it that Nintendo is developing their own, titled Yes Wii Can. Not only is my leg tingling, but my joystick is too! So you can pick up Wall Street Executives in your limo, screw them, toss them out, run them over and take your cash again? Will rampaging bands of racist tea baggers respond to to much progressive government? Is there a synopsis available for this game, just like what exists for Grand Theft Auto? The games allow players to take on the role of a criminal in a big city, typically an individual who rises through the ranks of organized crime through the course of the game. The player is given various missions by kingpins in the city underworld which must be completed to progress through the storyline. Assassinations, and other crimes feature regularly, but occasionally taxi driving, firefighting, street racing, bus driving(vice city) or learning to fly fixed-wing aircraft and helicopters are also involved. In later titles, notably those released after Grand Theft Auto 2, the player is given a more developed storyline in which they are forced to overcome an unfortunate event (e.g. being betrayed and left for dead), which serves as motivation for the character to advance up the criminal ladder and ultimately leads to the triumph of the character by the end of the storyline. The Grand Theft Auto series, belonging to a genre of free-roaming video games called "sandbox games," grants a large amount of freedom to the player in deciding what to do and how to do it through multiple methods of transport and weapons. he cities of the games can also be roamed freely at any point in the game, and are examples of open world video game environments which offer accessible buildings with additional minor missions in addition to the main storyline. There are exceptions: missions follow a linear, overarching plot, and some city areas must be unlocked over the course of the game. Hey, I learned the proper "prog off image" use! It may be the Budweiser, or it may be the Republican enlarged humor lobe in my brain, or a combination of the two, but I really love the final product. I take my Beret off to you Maksim! This turned out a better than I thought it would! Just so you know, you've failed to disappoint! Excellent comrade! I will preorder as many copies as I can! That way, a dishonest representation of supposed popularity may be established! This is just another way we can reach out to the the young and impressionable! It's for their own good that they be force fed informed of the right mind set before they have the dangerous capability of reasoning their own beliefs! Comrade Chedoh, your time in the gulag is paying off. You are hereby awarded a certificate of First Proper use of Prog Off/Prog On graphics. You will of course have to design and print your own certificate. Like warm clothing and shovels, the Party does not actually provide the certificate. We merely note in your dossier that you have earned one. Have no fear, I will make it out of 100% recycled materials! The game allows players to take on the role of a cleptocrat dictator of a big nation, the United Socialist States of America, typically an individual who rises through the ranks of community organisations through the course of the game until he reaches the zenith of his career: Dear Leader of the Nation. The player is given various missions by kingpins who donate to his campaign funds and further his career, which must be completed to progress through the storyline. Ruining the economy, taxing the middle class into oblivion, nationalising whole industries (Notably the Banking, Auto and Healthcare industries) and other crimes feature regularly, but regular golf playing, overseas shopping sprees, beer summits, and apologising and bowing to foreign dignitaries are also involved. It sounding to be like most exciting game. I am of special liking of overseas shopping sprees. Does winner also to get $540 Lanvin cap toe sneakers? I am of hope they come in the red color. This is the real description seen on the back of the actual game. "What does the American dream mean today? For Niko Bellic fresh off the boat from Europe, it is the hope he can escape his past. For his cousin, Roman, it is the vision that together they can find fortune in Liberty City, gateway to the land of opportunity. As they slip into debt and get dragged into a criminal underworld by a series of shysters, thieves and sociopaths, they discover that the reality is very different from the dream in a city that worships money and status, and is heaven for those who have them and a living nightmare for those who don't." here is the description for "GTN"
For Barack Obama fresh off the boat from Kenya, it is the hope he can become a community organizer for Chicago. For his wife, Michelle, it is a shopping spree in a nation she can't be proud of. Soon he gains power and rises to the rank of "President" as they slip their unknowing victims into debt and drag them into a dark alley if outnumbered by a series of ACORN, Liberal Media, and SEIU thugs if they object in plain view, he discovers that he can destroy people with a dream of earning money and status, and utopia awaits those who have joined him and a living nightmare for those who stand in his way. But if anyone has a better idea for a description, please feel free to put it down. Not only is my leg tingling, but my joystick is too! My X, Y, A and B buttons are tingling. This new game for the masses is worthy of Five Shazad's! 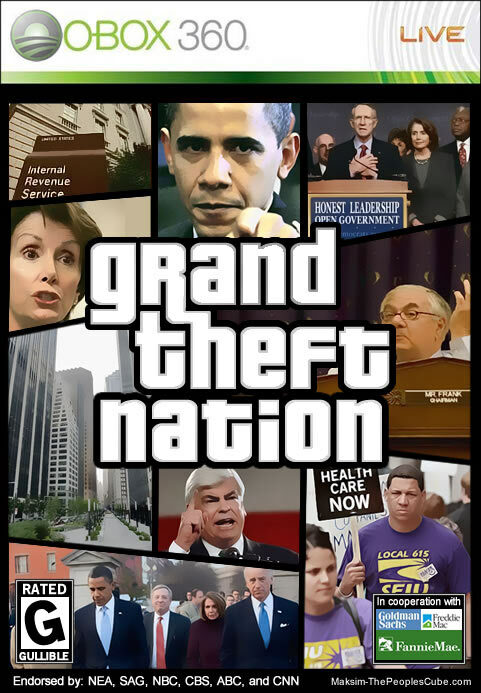 I just love the grand theft games and now to play as Dear Leader? Most excellent! Laika Space Czar ? Congratulations on the promotion Laika. 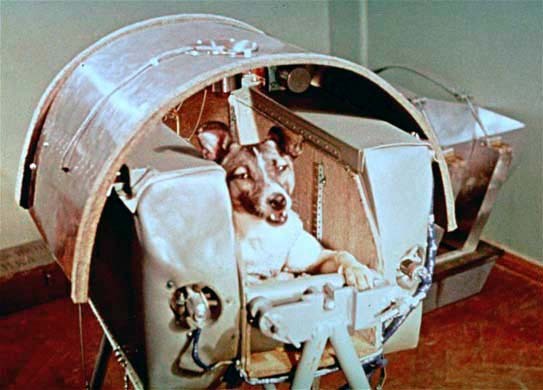 Actually this Laika Space Czar appears to be different than our Laika, the Space Dog. Perhaps alternate reality Hero Space Dog that fell through one of my forgotten wormholes? There can be only one Hero Space Dog. If anyone deserved a promotion it's him. He's been in orbit for decades. If this Laika Czar is an alternate reality Space Dog, he'd better be watching the sky very carefully. Expect almost anything. Equipped with the finest Soviet technology he's capable of targeting within (classified). Czar Czar, you should post Warning when posting such a frightening photo of radical reichest. I was most taken aback and had a heart stutter. How are these types of peoples allowed to walk around?! These are obviously evil reactionary terrorists. At all costs, don't let people of this demographic board aircraft, trains or buses, AND DO NOT ALLOW THEM TO DRIVE SUV'S TO TIMES SQUARE! It has been many years my comrades during the Great Temporal Time Rift of April 1, 2010 this is indeed the real Laika it only behoves me after my great decent back to earth I return. And I was thus promoted by the Gracious Dear Leader Obama as his new Space Czar to monitor transmission from evil right wing opposition. I only hope there is no confusion. It has been many years my comrades during the Great Temporal Time Rift of April 1, 2010 this is indeed the real Laika it only behoves me after my great decent back to earth I return. And I was thus promoted by the Gracious Dear Leader Obama as his new Space Czar to monitor transmission from evil right wing opposition. I only hope there is no confusion. Looks like I'll be getting a new cellmate in the Gulag! That's if you are not executed for being a impostor. Either way, I hope you like shovels! Perhaps you may tell us who is now sending messages to liberals in tin foil hats since "you" have "returned"? Hmmm I'm not convinced. You haven't sent anything to my tinfoil hat yet. The real Laika would have sent us all a transmission about the promotion.... yet no tinglies in my scalp. Care to explain? It seems that due to side effects of the worm hole, all kinds of alternatives from another dimension are pouring in here. Is this new Laika from Bizzaro Cube? This could be an imposter from the CIA planning to jam the transmissions to our tinfoil hats. Those capitalists will stop at nothing to distort the truth. I'm already starting to receive static that sounds like Megyn Kelly. Comrade Space Czar; there is much confusion. More so since I personally secured that rift, and restored the timeline to it's normal state. Hrmmm most peculiar. IMPOSTOR IMPOSTOR!! This must be denounced!!! GTA IV has a great soundtrack and I'm sure the track for GTN will be fabulous. The moral of this video Brothers & Sisters is that when it comes to Reich Wingers, the Iron Boot of Mother Russia will always prevail. Thus there should be no confusion, I only send our regressive progressive thoughts from our glorious leader to the media, like Keith Olberman, Chris Matthews and Rick Sanchez who in turn command our fellow progs! If your tin foil hat is not tingling check Chris Matthews leg. I will begin shovelling with Chedoh at once for the confusion and dishonor I have bestowed upon this great site and our Dear Leader Obama. Prog off: on a serious note I've been watching this site for just over a year now you guys are great probably one of the funniest sites I ever been to so I thought I would join. First I'd like to welcome you to The Cube. We are all equal brothers and sisters in the struggle for Hope & Change, although some are more equal than others. Also, I'd like to be the first to denounce you (before Colonel 7.62 does because he denounces everyone and everything). If you have been a troll on this site for a year like you say, then you would no doubt have known that Laika The Space Dog has been an essential member of The Party. They say that immitation is a form of flattery but I don't think Laika will be much too flattered. But I will leave that matter up to my more equal comrades. I will await the real Laika's transmission to know what to think about this matter. All I can say is I hope you have warm clothing and a shovel. I DENOUNCE SOLIDA..... Oh never mind. I do not denounce *everyone* and *everything*. For instance I gave up denouncing Pinkie a long time ago. And I haven't denounced myself in ages. For that matter I haven't denounced my Mosin PU Sniper rifle either. So there. Fraulein Pulloskies, I agree and join in your denouncement! Man the guard towers! Woman the Claymores! Transgender the slingshots! This Blue Cube from Chedoh shall suffer a most equal suffering!!!! And Red Square, NO, I'm not happy now. Look out Buffoon! Another impostor! I think this might be an INVASION! As the Commissar of Training Aids, Video Games, and Hypnotic TV devices, I demand a pre-released copy of this game. I need to test it so as the general public doesn't get offended by anything. Now if you'll excuse me, I has sum n00bs teh beet. For Tony Abbot fresh off his Yacht, it is the hope that he can protect his mass amounts of money as well as forgetting about Julia Gillard and her Carbon Tax. For his Master Obama, it is the vision that together they can usher in a new Global Financial Crisis and Suffering for Australian People and Make it the 51st state. As the country slips into debt favoring rich people, and get dragged into a world where everything is about the war on terror, they both discover a new found relationship as well as the reality of things. In GTA Liberal Players take control of Tony Abbot or Barrack Obama to fend off the Labor and Greens, Players have the ability to control the stock market at their will and watch Millions Starve, the game is sandbox meaning that players have the ability do what they please, the streets a Lined with Homeless people and Rich Billionaires in their limo’s, Players can Driver Cars, Buses, Fixed winged Lear Jets and Much Much more! Hmmmm, maybe Australia is one or more (it is rather large) of the 57 States that our Dear Leader was talking about. You may be on to something there Comrade Rusiakid. Also, your idea sounds like it should be included in Grand Theft Nation II. Breaking NEWS! Video Game Recall.